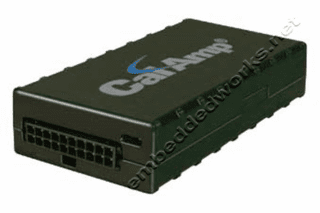 The LMU-2620 is an economical vehicle tracking product designed for easy and reliable installation in automobiles. The LMU-2620 is an ideal solution for stolen vehicle, vehicle finance, auto rental and other automotive tracking applications. The LMU-2620 high-value tracking unit from CalAmp features a small size, superior GPS performance, ultra low power sleep modes, and three Inputs/Outputs (I/O). The LMU-2620 is a complete vehicle tracking and communications device incorporating next-generation, super-sensitive GPS technology on HSPA cellular networks for installation in any 12 or 24 volt mobile vehicle. PEG continuously monitors the vehicle environment and responds instantaneously to pre-defined threshold conditions related to time, date, motion, location, geo-zone, input and other event combinations. With PEG, your unique application will meet demanding customer requirements. This behavior can be programmed by CalAmp before shipment, at a customer?s facility, or over-the-air once the unit has been fielded.